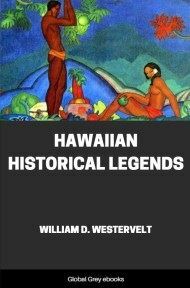 Originally published in 1915, this book provides an abundance of legends; of the struggles, the triumphs, and the wanderings of the Hawaiian people.As soon as the Hawaiian alphabet was prepared, in 1821, native writers began delving into their past, finding a treasure mine of romantic stories and of valuable ethnological and historical facts in regard to the Polynesian race. 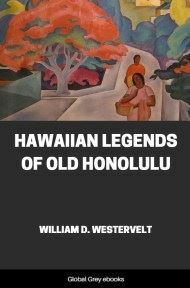 These stories were written originally in Hawaiian, for native newspapers, and were collected and translated by the author, W. D. Westervelt. THE fountain source of the Mississippi has been discovered and rediscovered. The origin of the Polynesian race has been a subject for discovery and rediscovery. The older theory of Malay origin as set forth in the earlier encyclopædias is now recognized as untenable. The Malays followed the Polynesians rather than preceded them. 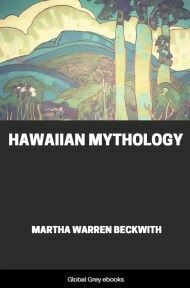 The comparative study of Polynesian legends leads almost irresistibly to the conclusion that the Polynesians were Aryans, coming at least from India to Malasia and possibly coming from Arabia, as Fornander of Hawaii so earnestly argues. It is now accepted that the Polynesians did not originate from Malay parentage, and that they did occupy for an indefinite period the region around the Sunda Straits from Java to the Molucca Islands, and also that the greater portion of the Polynesians was driven out from this region and scattered over the Pacific in the early part of the Christian Era. The legends that cluster around Wakea have greatly aided in making plain some things concerning the disposition of the Polynesians. By sifting the legends of Hawaii-loa we learn how the great voyager becomes one of the first Vikings of the Pacific. His home at last is found to be Gilolo of the Molucca Islands. 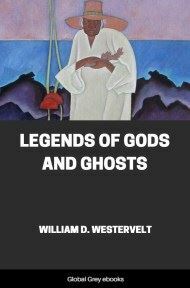 From the legends we become acquainted with Wakea (possibly meaning "noonday," or "the white time") and his wife Papa (earth), the most widely remembered of all the ancestors of the Polynesian race. Their names are found in the legends of the most prominent island groups, and the highest places are granted them among the demi-gods and sometimes among the chief deities. Their deeds belong to the most ancient times--the creation or discovery of the various islands of the Pacific world. Those who worshipped Wakea and Papa are found in such widely separated localities that it must be considered impossible for even a demi-god to have had so many homes. Atea, or Wakea, was one of the highest gods of the Marquesas Islands. Here his name means "light." The Marquesans evidently look back of all their present history and locate Atea in the ancient homeland. Vatea in the Society Islands, Wakea in Hawaii and New Zealand, Makea, Vakea and Akea are phonetic variations of the one name when written down by the students who made a written form for words repeated from generation to generation by word of mouth alone. Even under the name "Wakea" this ancient chief is known in most widely separated islands. The only reasonable explanation for this widespread reference to Wakea is that he was an ancestor belonging in common to all the scattered Polynesians. It seems as if there must have been a period when Wakea was king or chief of a united people. He must have been of great ability and probably was the great king of the United Polynesians. If this were the fact it would naturally result that his memory would be carried wherever the dispersed race might go. In the myths and legends of the Hervey Islands, Vatea is located near the beginning of their national existence. First of all the Hervey Islanders place Te-ake-ia-roe (The root of all existence). Then there came upon the ancient world Te Vaerua (The breath, or The life). Then came the god time--Te Manawa roa (The long ago). Then their creation legends locate Vari, a woman whose name means "the beginning," a name curiously similar to the Hebrew word "bara," "to create," as in Gen. i. 1. Her children were torn out of her breasts and given homes in the ancient mist-land, with which, without any preparation or introduction, Hawaiki is confused in a part of the legend. It has been suggested that this Hawaiki is Savaii of the Samoan Islands, from which the Hervey Islands may have had their origin in a migration of the Middle Ages. One of the children of Vari dwelt in "a sacred tabu island" and became the god of the fish. Another sought a home "where the red parrots' feathers were gathered"--the royal feathers for the high chiefs' garments. Another became the echo-god and lived in "the hollow gray rocks." Another as the god of the winds went far out "on the deep ocean." Another, a girl, found a home, "the silent land," with her mother. Wakea, or Vatea, the eldest of this family, remained in Ava-iki (Hawaii), the ancestral home--"the bright land of Vatea." Here he married Papa. This Ava-iki was to the Herveyites of later generations the fiery volcanic under-world. When the long sea-voyages ceased after some centuries, the islanders realized that Ava-iki was very closely connected with their history. They had but a misty idea of far-off lands, and they did know of earthquakes and lava caves and volcanic fires-so they located Ava-iki as the secret world under their islands. This under-world with legendary inconsistency was located on the ocean's surface, when it became necessary to have their islands discovered by the descendants of Vatea. According to the Hervey legends, Vatea was the father of Lono and Kanaloa, two of the great gods of the Polynesians. They were twins. Lono had three sons, whom he sent away. They sailed out through many heavens and from Ava-iki pulled up out of the deep ocean two of the Hervey Islands. The natives of the Hervey group supposed that the horizon around their group enclosed the world. Beyond this world line were heavens and heavens. A daring voyager by sailing through the sky-line would break out from this world into an unknown world or a heaven bounded by new horizons. Strangers "broke through" from heaven, sometimes making use of the path of the sun. Thus about twenty-five generations ago Raa (possibly Laa, the Hawaiian) broke down the horizon's bars and established a line of kings in Raiatea. So also when Captain Cook came to the Hervey Islands the natives said: "Whence comes this strange thing? It has climbed up [come up forcibly] from the thin land, the home of Wakea." He had pierced the western heavens from which their ancestors had come.